Here is the solution! 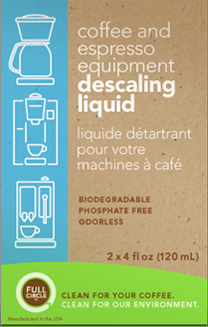 Full Circle Descaling Solution that is! Bust it open, add 32 ounces warm or hot water and get a clean machine. This formulation works for coffee makers and espresso machines. Why descale? Descalers are designed to break down the lime scale and mineral build-up inside your brewer to ensure great, consistent, coffee. The first step is to use fresh filtered water and then follow up with a descale regimen for the best tasting coffee and espresso.